I Thought I was a Smith: George comes back... or does he? Please don't think that George was a rotter who abandoned his pregnant 19 year old wife only two months after marrying her - that's not the case. 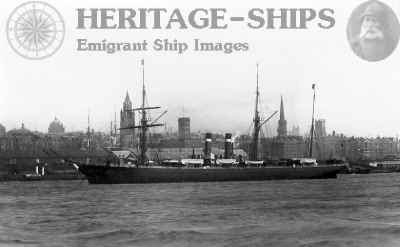 I presume he went to Canada on his own to have a bit of a look around, get some work and find a home for himself and his new family, because about a year later, he apparently went back to England, picked up Louisa and the baby, and the three of them sailed to Canada, all using the name Smith, in 1876. But where's the evidence for this? Well, it's partly hearsay from the family, partly from immigration dates that George and Louisa gave on later census records, and partly from a passenger list from the SS Peruvian, which shows a George Smith (he sometimes called himself George and sometimes Thomas), age 25, labourer; and further down the page, Louisa Smith, age 21, spinster, with a female infant. But why was George listed separately, and why did Louisa call herself a spinster? There could be simple answers to both questions - or it's entirely possible that these are all the wrong people. So far, I haven't found any record of George making the earlier journey back from Canada to England. Perhaps the family got the wrong end of the stick, George never went back at all, and Louisa and the baby travelled on their own, on this ship or a different one; or perhaps all three of them were on a different ship that I haven't found yet. Who knows? This is one of the many loose ends in this story that still need tying up. The SS Peruvian at Liverpool. Did the Smiths travel to Canada on this ship? Maybe. What I know for sure is all three of them ended up in Canada one way or another. And George and Louisa Cockram, who became known by one and all as Thomas and Lucy Smith, lived happily together for many years thereafter. Or did they....? My husband has a radical theory about the whole George-Thomas thing: What if George Cockram was a horrible man, which poor Louisa didn't realize until after she'd married him. If only she had married her other suitor, Thomas Smith, instead! So Louisa and Thomas got together again, bumped George off and high-tailed it to Canada in 1876, where they started the myth that George had changed his name. And the Thomas Smith who went to Canada on the Dominion in 1875 was somebody else altogether. Interesting, no? Of course I refuse to believe that my great-grandparents would do such a dastardly thing, but thinking about it made my brain jump through some interesting hoops (which easily convinced me the whole idea of George and Thomas being two different people is ridiculous) and more importantly, it reminded me that I have to keep an open mind and think outside the square. So this preposterous theory has been useful. Now that I've cleared that up, I intend to spend a little time thinking about why George and Louisa moved to Canada, which may or may not be connected to why they became Smiths. Stay tuned. Interesting story, I hope you find out what happened. Perhaps there wasn't much to smile about, and that's why George scarpered. Hello Bev, I hope so too. I think 'smiling for the camera' didn't become the done thing until early in the 20th century, when people generally had better teeth, and photography became more common, and not such a formal occasion. And of course, back in the days when an exposure could take about 15 minutes, it was just too hard to keep a smile on your face that long.